Cities, included in the list: Aix-en-Provence, Arles, Avignon, Cavaillon, Gordes, Hyeres, Le Lavandou, Lourmarin, Manosque, Saint-Remy-de-Provence, Salon-de-Provence, Toulon. I've also put Nimes on the list - even if it doesn't belong to this region, it's very close to Provence' borders, so lot of tourists, travelling through Provence, include Nimes to this trip as well. Please also pay attention to the fact that Cote d'Azur (contrary to prevailing opinion) doesn't belong to Provence (not even Grasse ;) ) The 'traditional' region Provence includes 4 departments - Alpes-de-Haute-Provence, Var, Vaucluse and Bouches-du-Rhône. Cote d'Azur cities as well as Grasse can be found in separate section of the blog. Brands: at least Arquiste*, Byredo, Cinq Mondes, Fornasetti, Liquides Imaginaires. There also used to be Jardins d'Ecrivains*, La Manufacture des Châteaux, Odin. Brands: Absolument Parfumeur, Annick Goutal, By Kilian, Cire Trudon, Diptyque, Juliette has a Gun, Jean Charles Brosseau, Maison Martin Margiela, Serge Lutens, Terry de Gunzburg. The branch at 1, Rue Clemenceau stocks Absolument Parfumeur, Annick Goutal, Acqua di Parma, Creed, Molinard, Premiere Note, Serge Lutens. Brands: Maitre Parfumeur et Gantier. Brands: Baobab Collection, Etat Libre d'Orange. Brands: ACQUA DI PARMA, Atelier Cologne, BAXTER OF CALIFORNIA, Bvlgari le Gemme, By Kilian, Caron, Fresh, GEOFFREY BEENE, Juliette has a Gun, Jo Malone, LAURA MERCIER, LES MERVEILLES LADURÉE, Molinard, Reminiscence, Serge Lutens, Tom Ford Private Blend. Brands: Atelier des Ors, Acqua di Parma, Diptyque, Frederic Malle, L'Artisan, Making of Cannes, Parfums Nicolai. Brands: Acqua di Parma, Annick Goutal, Parfums de la bastide, Serge Lutens. Brands: Byredo, Comme des Garcons. Brands: Comme des Garcons, Cire Trudon, Parfum d'Empire. Brands: Acqua di Parma, Jean Charles Brosseau. Brands: Absolument parfumeur, Acqua di Parma, Annick Goutal**, Comptoir Sud Pacifique, Fariboles parfums, Ligne St Barth, L'Artisan, Parfums Berdoues, Reminiscence, Serge Lutens**, Voluspa. Brands: at least Molinard and Serge Lutens. Brands: Acqua di Parma, Laurence Dumont Les Senteurs Gourmandes. Brands: at least Acqua di Parma, Atelier Cologne, Byredo, Making of Cannes, Odin, Serge Lutens, Tom Ford Private Blend, Van Cleef&Arpels Collection Extraordinaire. Brands: 100 Bon, Comptoir Sud Pacifique, Molinard. L'Occitane' factory and showroom. Factory guided tour are offered, as well as special offers for people on the tour: 10% discount on all products. Brands: at least Arty Fragrances, Acqua di Parma, Creed, Diptyque, L'Artisan, Making of Cannes, Parfums Nicolai, Serge Lutens. Brands: if still opened - Parfums de la Bastide. Brands: Juliette has a Gun*, Voluspa. Cozy hotel with Diptyque corner. Brands: at least Acqua di Parma**, ASTIER DE VILLATTE**, Carner, Geo F Trumper, Heeley, Institut Très Bien, Lubin, Nasomatto, Ortigia, Parfum d’Empire, Profumum, Serge Lutens. Brands: Laurent Dumont, Houbigant, Molinard. Soap factory, boutique and Musee du savon de Marseille, dedicated to manufacture of famous Marseille' soap. Brands: Acqua di Parma, Annick Goutal, Caron*, Creed, Comptoir Sud Pacifique*, Cire Trudon, d'Orsay*, E.Coudray*, Editions de parfums Frédéric Malle, Jean Charles Brosseau*, Jacques Fath, Lubin, Les Parfums de Rosine, Molinard*, Mona di Orio, Marc Antoine Barrois, Nasomatto, Parfum d'Empire, Perris Monte Carlo, Robert Piguet, Serge Lutens, The Different Company*, The Hype Noses*. 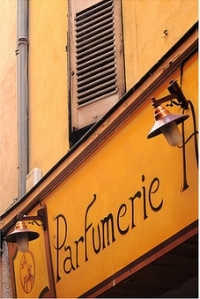 +According to au parfum: État Libre d’Orange**, Geoffrey Beene, Houbigant, Isabey, Jean Desprez, L.T. Piver, Penhaligon’s. Brands: Annick Goutal**, ACQUA DI PARMA, ATELIER COLOGNE**, Comptoir Sud Pacifique, Caron, Diptyque, Jean-Michel Duriez, Juliette has a Gun, L'Artisan, MAISON FRANCIS KURKDJIAN, MAISON MARTIN MARGIELA, Reminiscence, Serge Lutens. Brands: SLM sous le manteau. La maison 24 Saporta (24 Rue Gaston de Saporta) in Aix de Provence. C-BO (1 Rue des Trois Faucons) in Avignon.